As we men­tioned last month, late sum­mer and ear­ly fall are busy sea­sons for wed­dings in Los Ange­les and we thought it would be good to go over the best prac­tices for set­ting up for a wed­ding. 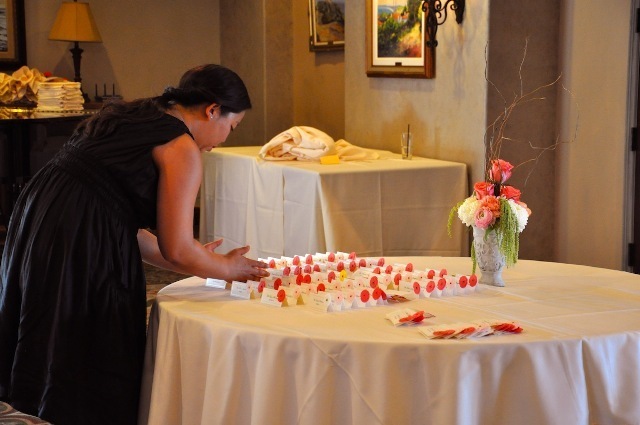 Read on for more details on a typ­i­cal wed­ding like the one we did last month at the Palos Verdes Golf Club (all pic­tures here are from one wed­ding day set­up). You can also down­load Flower Duet’s Wed­ding Flower Set Up Check­list to help you remem­ber what to do before the big day while you are still in the plan­ning stages with the wed­ding cou­ple and for what to do on the big day itself. These days it’s pret­ty nor­mal for a cou­ple to have its own wed­ding coor­di­na­tor and for there to be a wed­ding coor­di­na­tor on site at the wed­ding venues. It’s a real­ly good idea to meet with all the coor­di­na­tors or be in touch via phone and email. Make sure you have everyone’s mobile phone num­ber pro­grammed into your own phone so you can text dur­ing the big day. Also, make sure every­one has your mobile phone num­ber, too. 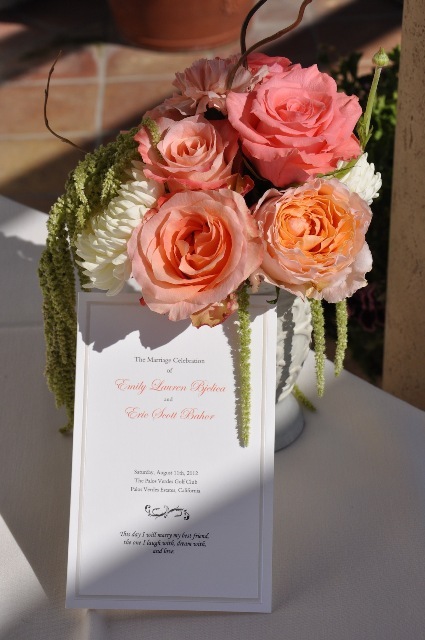 Some of the wed­ding venues we set up for wed­ding flow­ers are huge lux­u­ry resorts like the St. Reg­is in Monarch Beach or Ter­ranea in Ran­cho Palos Verdes. Often, it can be very hard to fig­ure out where to park to first drop off per­son­al flow­ers (bou­quets, bou­ton­nières, cor­sages) for pic­tures. Then, you need to set up the arch and pew décor in anoth­er part of the prop­er­ty only to final­ly get to the recep­tion ball­room that might be in a com­plete­ly dif­fer­ent place. So, it’s best to do a lit­tle recon­noi­ter­ing before the event. Find out where to park from the onsite coor­di­na­tor and even arrange to meet with him or her before­hand so you know where you need to go. Both my hus­band and I worked as Valet Park­ing Atten­dants at var­i­ous times after col­lege, so we know what it’s like to make a liv­ing from tips. It pays to tip the valet and bell­men at resorts and hotels. Bell­men will more than like­ly help you car­ry the flow­ers to the hotel room and maybe even give you a bot­tle of ice water to send you on your way (That’s hap­pened to me!). Valets will help you by let­ting you park your car in the cir­cle so you can bypass the park­ing fee, so go ahead and give him some of that fee you save as a tip. And, you may be back at that same hotel next week for your next wed­ding and those same peo­ple will be work­ing. They’ll remem­ber if you tipped or not, so be nice to “the help” and they will help you. I would sug­gest $2-$5 per per­son help­ing you out depend­ing on how many flow­ers you need to deliv­er. Bring Cash for Tips, Park­ing, and Snacks. Some­times you need to wait around to move arch dec­o­ra­tions or take down the arch, so make sure you have some cash to buy a Coca-Cola at the hotel bar. 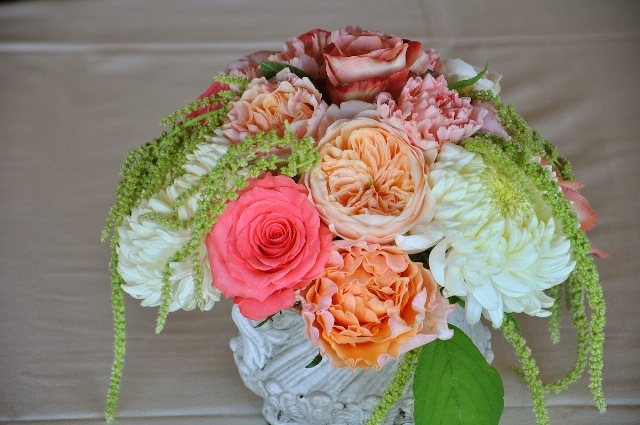 Give your­self plen­ty of time to pack up the car or van with the flower designs. This will always take longer than you think. Leave your design stu­dio or shop ear­li­er than you think you need to. You don’t want traf­fic to be an issue. Bring lad­ders, trol­leys and any­thing else you might need to set up the arch or take flow­ers to their final des­ti­na­tion at the venue. Keep flow­ers like hand-tied bou­quets inside vas­es of water for deliv­ery. The extra cost is worth your flow­ers look­ing fresh through­out the day. Make a plan to drop off cen­ter­pieces at the venue so they are not cook­ing inside your car or van for too long. 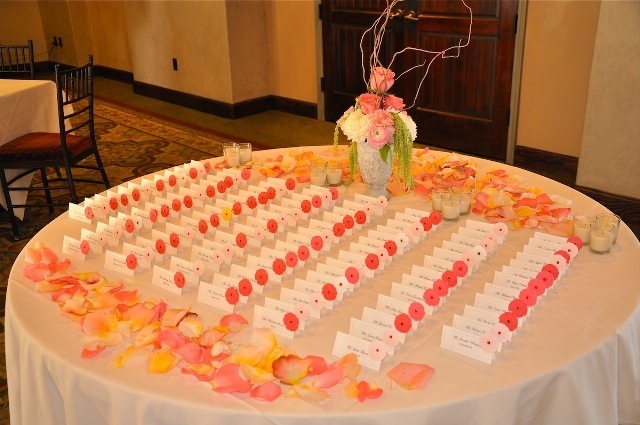 Even if the tables and linens are not set up yet, at least you can “stage” your flow­ers in the area where they will go. Wait to set up arch décor if it’s a hot day, until the last minute. Bring help so you can set up the flow­ers quick­ly. 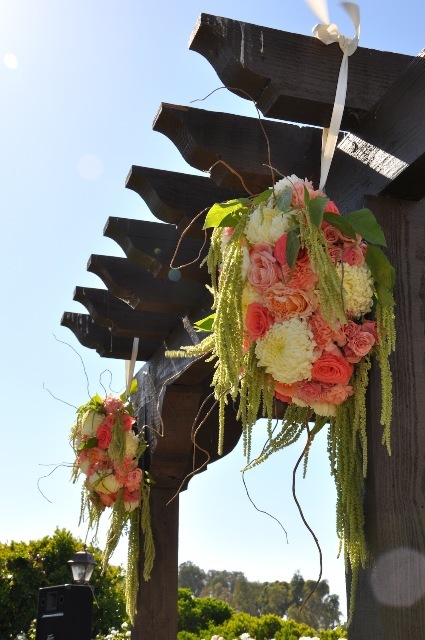 Put down aisle petals at the last minute or give the coor­di­na­tor a big bag of them to drop on the aisle if it’s a windy day. Bring your cam­era and take pho­tos of every­thing along the way. As long as you arrived at the venue ear­ly to set up, you should have plen­ty of time to take pho­tos of your work. 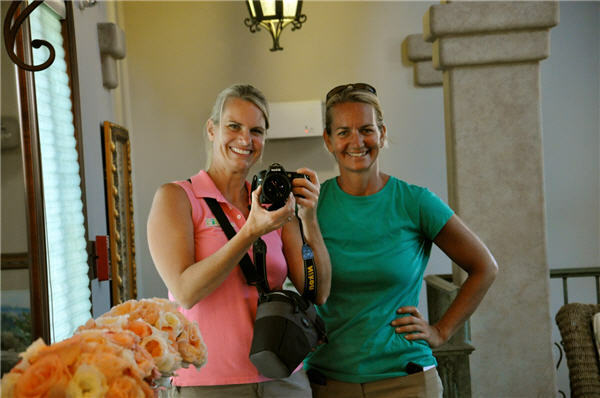 Don’t for­get to net­work with the wed­ding pho­tog­ra­ph­er to get some of the great shots of the bride with her bou­quet for your port­fo­lio, too. Make sure you have busi­ness cards on hand and ready to pass out to the video guy, DJ, pho­tog­ra­phers, wed­ding coor­di­na­tors and any­one else who admires your work. When you receive busi­ness cards from oth­ers, make sure you take a moment to look at it first and then ask them some­thing about their card … so they know you care about them, too. All the pho­tos in this sto­ry were from a wed­ding we did in Palos Verdes in August. 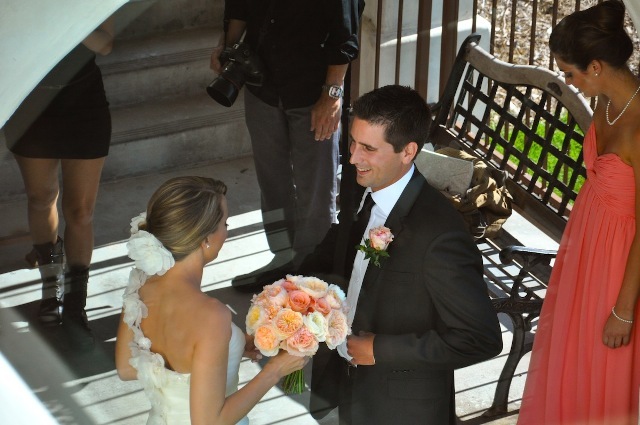 Here is how the day devel­oped so you can see what to expect when you have a wed­ding to set up. The Palos Verdes Golf Club is close to our flo­ral design stu­dio, so we were able to keep things cool until the last minute, and load care­ful­ly. We arrived on site to find the pre­vi­ous wed­ding was still wind­ing down, so the tables were still miss­ing linens and the bridal room was still occu­pied. But with 90-degree heat it was impor­tant to be able to unload as soon as pos­si­ble. We met the wed­ding coor­di­na­tor who was hired to assist our bride for the day. Ida Gard­ner Events is a won­der­ful oper­a­tion with whom we had worked in the past, mak­ing our set up even eas­i­er. Ida and her assis­tant helped clear space for us to bring in all the flo­rals until the venue was ready. 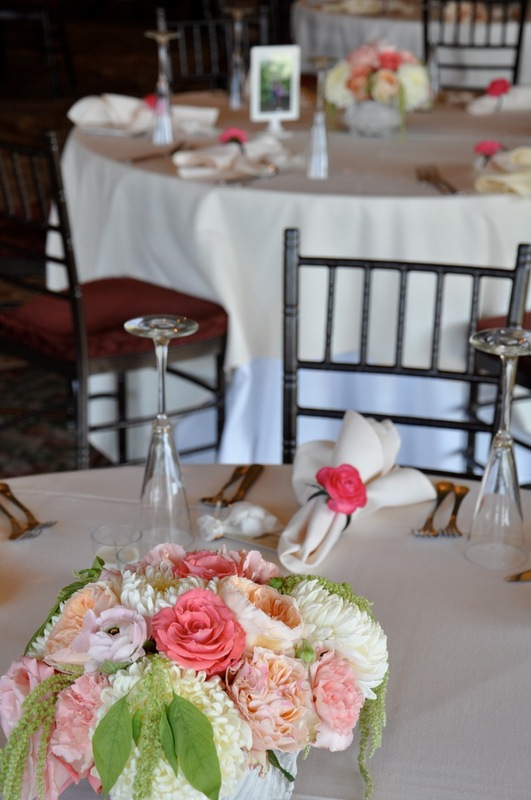 With a venue like the PV Golf Club, they are pro­fes­sion­als and work quick­ly and effi­cient­ly, in no time at all the linens were swapped, tables moved and the bridal room read­ied. 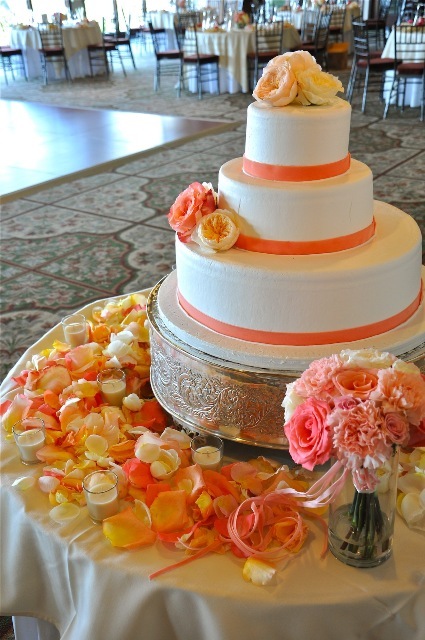 The cen­ter­pieces went on the tables as soon as the linens were down, the cake table was dec­o­rat­ed, the bar tables adorned. 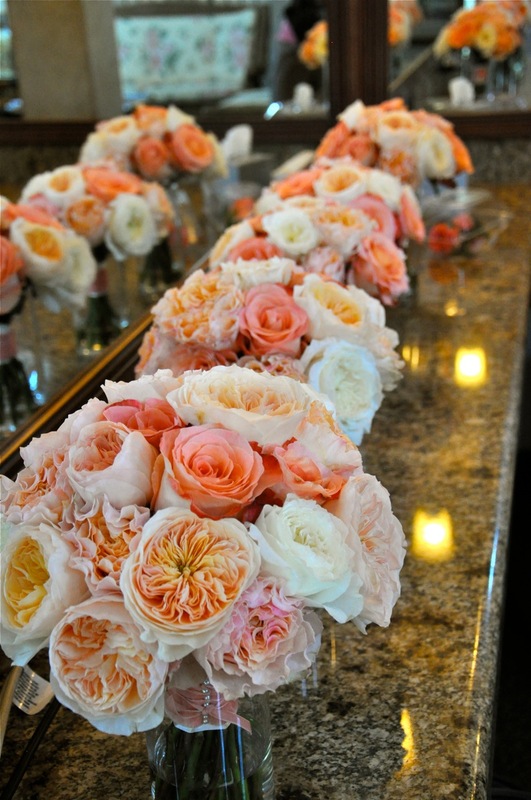 The bride had not arrived so we want­ed to have those placed in the room so she would see them as she walked in. 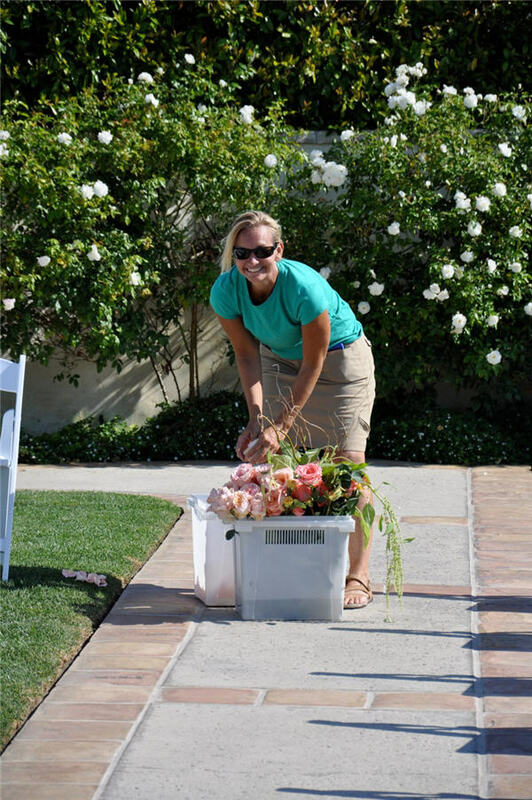 We make a habit of deliv­er­ing the bridal bou­quets in water, to ensure their fresh­ness, as well as to keep their shape. Ida want­ed one of the arrange­ments taller, for the dis­play she was cre­at­ing for the place cards, so we did that, as we always bring extra flow­ers for these sorts of things. We wait­ed until the last minute to hang the flo­ral sprays so that they did not sit too long in the heat. Bring at least two lad­ders or step stools if you can or check with the venue to see if they have them on the site. Two peo­ple are bet­ter than one to hang these. While I was doing some tweak­ing, Kit had her cam­era snap­ping away. Don’t for­get to bring your cam­era and take more images that you think you will need. You may be able to get images from the Pho­tog­ra­ph­er, but always bet­ter to have your own. 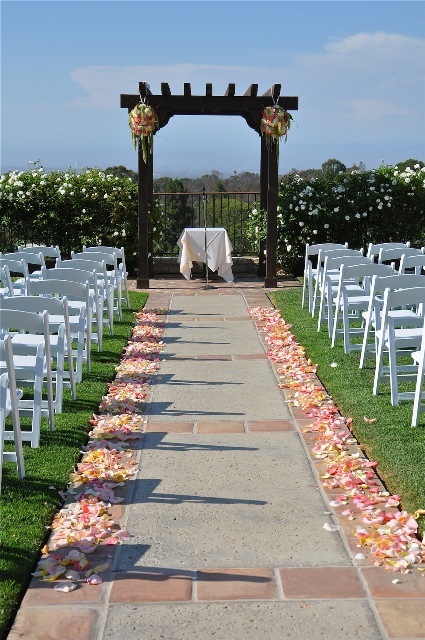 The last step is always the petals for the aisle. By this time you have tweaked, added and used all the extra flow­ers that you brought, so now you can petal all the ros­es for the love­ly walk down the aisle. As we wrapped up the fin­ish­ing touch­es the video crew and the pho­tog­ra­phers made their way over to us at the start of the aisle. We all looked at the pret­ty scene and swapped busi­ness cards and promised to all like each oth­er on Face­book. If you have time, do one last go around to check all your pieces. 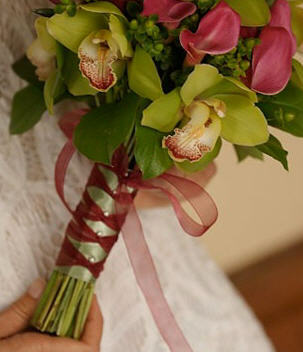 Make sure there is enough water in the vas­es, no flower heads have snapped off or fall­en out. Check in with the Wed­ding Coor­di­na­tor as she always has her eyes on the details and will let you know if some­thing is miss­ing or will tell you it is just so pret­ty! Last month we talked about movies that fea­ture a florist as the main char­ac­ter. This month, with the start of the fall TV shows, we thought it would be fun to fea­ture some of our favorite shows that have great flo­ral designs each week. Some of these are sum­mer shows and some don’t start until Jan­u­ary and some you’ll just have to get on DVD but you can enjoy the flow­ers and the shows! Both the Van Der Wood­sen and Wal­dorf apart­ments always fea­ture amaz­ing flo­ral designs. Check out the Gos­sip Girl Flo­ral Design­er. Watch free Gos­sip Girl Videos on The CW web­site. Jack’s office always has the best telev­sion flo­ral design we’ve seen. Since this show takes place in The Hamp­tons, prac­ti­cal­ly every scene has amaz­ing flow­ers! What’s not to like about the main char­ac­ter on this show. She over­comes adver­si­ty on every episode and is so sweet doing it. The law offices are very nice and so is the flo­ral dec­o­ra­tion. We con­tin­ue to add more videos to our YouTube chan­nel. This month we’ve added a video that fea­tures lots of wed­ding flow­ers from a vari­ety of wed­dings so you can see the depth of Flower Duet’s work. We like to say we can do any­thing and that we can make your vision come true. 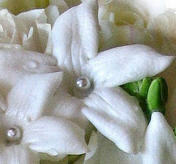 To learn more about our wed­ding pack­ages, vis­it flowerduet.com/weddings. Sub­scribe to our YouTube chan­nel: fash­ion­ingflow­ers so you’ll know when we’ve uploaded a new show! 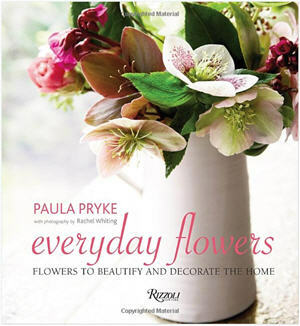 Paula Pryke does it again with a fan­tas­tic flower design book. This time, she goes into detail on what to grow in your own gar­den for flo­ral designs. True to her impec­ca­ble style, this book also fea­tures some won­der­ful and classy flo­ral designs. This book is a great addi­tion to any flo­ral designer’s library. 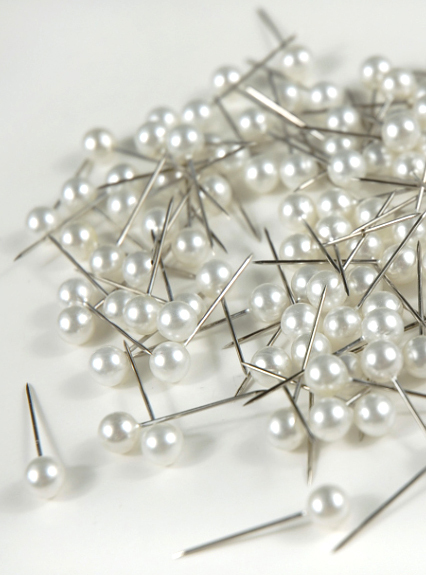 A pin with a lit­tle pearl bead might seem like such a small item to fea­ture as a “flo­ral tool” but these ver­sa­tile pins are won­der­ful in many ways. 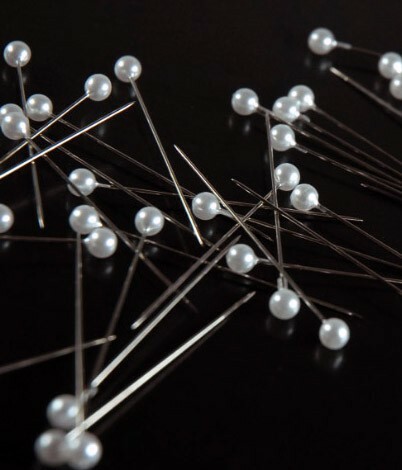 In addi­tion to using them to pin bou­ton­nières (bouts) on dads, grooms, grooms­men and ring bear­ers, these pins can be adapt­ed to help secure rib­bon to hand-tied bou­quets and offer a fash­ion­able accent to the stems of a bou­quet. 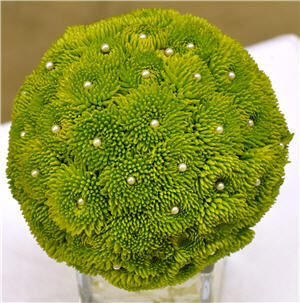 Also used to accent flow­ers them­selves as shown above on this poman­der of green Ker­mit mums. Used to cre­ate a nice look at the end of stephan­otis reser­voirs. This looks much nicer than just the cot­ton tips of the reser­voirs. We used to cut reg­u­lar bou­ton­nière pins in order to fit them into the short part of a stephan­otis stem reser­voir, but now you can pur­chase short ver­sions of pins to use for flower accent­ing. 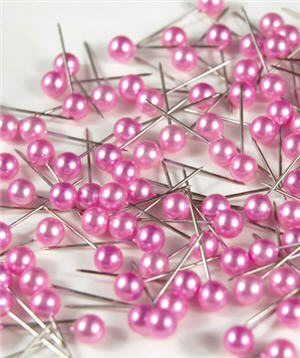 These are called “Pearl Tiny Pix­ie Bou­quet Pins” and you can pur­chase them through save-on-crafts.com. You can get them in a vari­ety of col­ors includ­ing pink! There are oth­er “fan­cy” pins you can use to bejew­el your flow­ers. 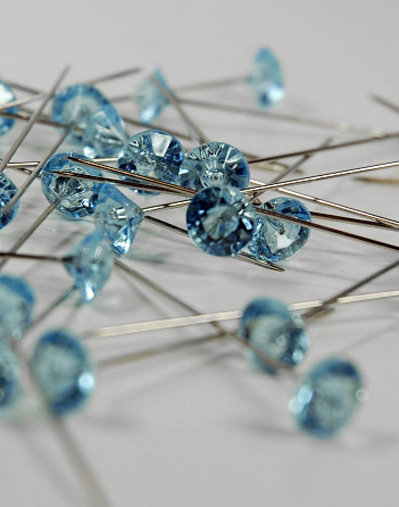 These are called “Light Blue Rhine­stone Dia­mante Cor­sage Pins” and can be used in a vari­ety of ways includ­ing adding a “blue” theme to your flo­ral designs if you can­not get blue flow­ers.